This 2014 report in the Globe and Mail is still relevant in 2017. China will carry out a nationwide poll next month to test the public’s acceptance of genetically-modified food. Editor note: It is more like getting the public ready to accept state sanctioned GMO expansion. 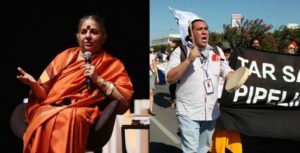 On Wednesday May 31, environmental justice activists Clayton Thomas-Müller and Vandana Shiva will speak on this year’s theme, Social Justice = Environmental Justice: Rethink! Reclaim! Respect! Mike talks to Stephanie Parent, Senior Attorney at the Center for Biological Diversity about how Dow Chemical is putting pressure on the Trump Administration to ignore government studies on the dangers of certain pesticides.